The long, gently undulating ridge of the Cromdale Hills lies across Strathspey from my home. 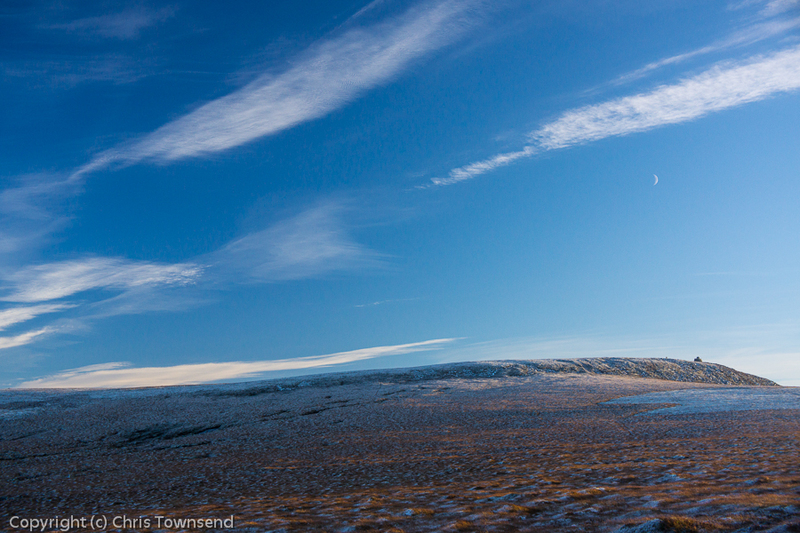 I see these moorland hills every day. I watch the clouds drifting over their silhouette and, at this time of year, the snowline rising and falling, appearing and vanishing. Yet despite their proximity and prominence in the view I rarely walk on them. The higher, wilder, more rugged and more dramatic hills just to the west call to me more strongly and it is to them that I usually go. Yesterday was different though. The high hills were in cloud and the wind whistling down the glen suggested it could be hard to stand up at 1,000 metres. 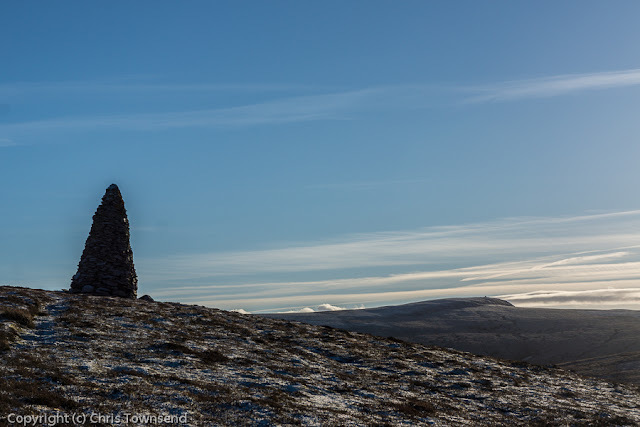 The sky above the Cromdales was bright blue though and a faint paleness to the summits suggested there might be a touch of snow so, for the first time in four years, I went to these hills. From Cromdale village lanes and tracks took me through a mix of rough pastures and conifer plantations. Frost lay thick everywhere shady, there was ice on the puddles and the air was sharp and cold. Passing through a dark corridor in the trees I felt the bitter chill sinking into me. At a gap in the trees I looked down a bright corridor to sunlit meadows, a shining gateway to warmth and light, a seeming entrance to a veritable paradise. But when I left the shelter of the trees I found the promise was false. I did indeed step into the sunshine but also into the biting wind. 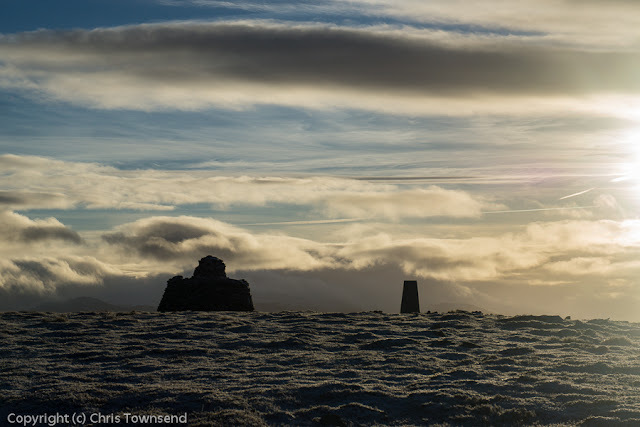 Beyond the wonderfully named Claggersnich Wood I was out on open heather moorland, climbing up the slopes on a rough track to the tall Coronation Cairn, built for the crowning of King Edward VII and Queen Alexandria in 1902. Looking back Strathspey was a patchwork of fields and woods and moors with the Paul’s Hill wind farm dominating the horizon. This is developed countryside, not wild land. The woods are mostly commercial plantations. The lowlands are farmed and the uplands are heavily managed for grouse shooting. 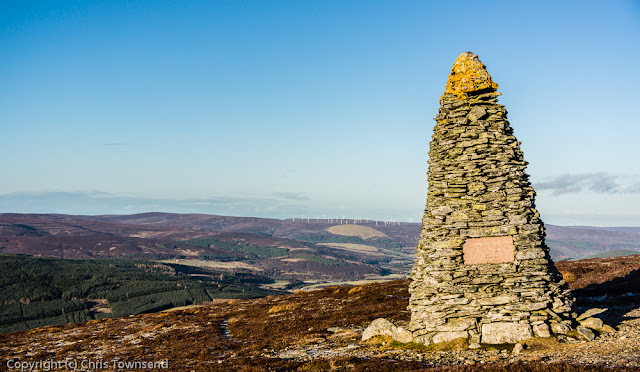 From the Coronation Cairn I followed the broad ridge to the square block of the Jubilee Cairn, built for Queen Victoria’s Golden Jubilee in 1887, and the trig point on the summit of Creagan a’Chaise, the highest Cromdale hill at 722 metres. The soft and boggy ground was frozen, making the walking easier than usual, my boots crunching into the crisp mud. The wind was strong though, blasting against me and stinging my face. I was glad I had not gone to higher hills. The wind kept the air fresh though and the light was magical with the low sun turning the grasses golden. On the shaded side of every tussock snow and frost lay, protected from the faint heat of the sun and the scouring of the wind. From Creagan a’Chaise I could see the thick clouds to the west rising towards the setting sun. I huddled behind the cairn for a snack and a hot drink, glad of my down jacket, then set off back down the ridge. The clouds enveloped the sun and the colourful sunset I had hoped for was lost. The world was dull and grey again but the light and the cold and the frost had given these rolling hills a touch of arctic tundra for a brief spell. I enjoyed a good walk over these hills earlier in the year Chris; with the added bonus of bumping into the Reindeer herd (or rather one or two of the bumping into me, yhey seem a wee bit inquisitive at times! ).